We've tried to build this page in order to help point you in the right direction for finding information about your Corvette and its past owner(s). Below is a compilation of links on the web leading to various sites that may be of help to you in your search for that information. In some states in the US, it's possible to work with state and local government officials in acquiring past vehicle and owner history by providing the vehicle's VIN number. *Fleet and exported vehicles excluded. Chevrolet Restoration Kits may include the following information: vehicle highlights, color codes, wheel/tire facts, engine/transmission/suspension specifications, standard equipment, options information, trim package information, brake specs, suspension information, vehicle features, exterior and interior dimensions, engine options, production numbers, technical bulletins and VIN/serial number decoding information. Thsi information comes from original GM-produced documents such as data books/specification guides, AMA specs, price schedules, etc. Vintage Vehicle Services offers special restoration packages which are very different from those that are offered for free in the US. These packages document your exact car, based on its VIN, listing options, production date, selling dealer, trim and paint codes, etc. on G.M. letterhead. 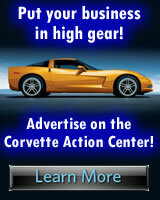 These packages are available for any Canadian sold Corvette, or even U.S. sold cars if they are 8 years old or newer. The price (as of June 2002) is $48.15 Canadian including shipping and taxes. Call them with your Vehicle Identification (Serial) Number toll-free (in Canada) 1-888-467-6853, between 8 a.m. and 5 p.m. EASTERN Time. (Outside Canada 1-905-440-7636) or contact George Zapora via email. For more detailed information about Vintage Vehicle Services, please visit: http://www.gmcanada.com/english/maintenance/parts/parts_vint.html.